Understanding the printers gamut and how to best display your artwork ready for print. theprintspace's step-by-step guide to understanding the printers gamut and how to best display your artwork ready for printing. Intense colour information is easily captured by your digital camera and displayed by your monitor, yet would not be able to be reproduced on the printer. One shows the gamuts of our standard RGB profile, Adobe 1998, and digital c-type on Fuji Crystal Archive Matt and you can see that Adobe 1998 is larger and holds tones that lie outside of the capabilities of the printer. As we said in our video about soft proofing, to see what our print will look like we must convert from Adobe 1998 to the print profile, but this conversion will mean removing colours which can't be printed. This is done automatically using a conversion engine, either Relative Colorimetric or Perceptual or but for maximum control it can be done manually, and this video will demonstrate how. For example, if you want to print the image two using digital c-type Fuji crystal archive matt, select theprintspace Fuji Matt profile in Photoshop's view soft proof tool and click ok. Now in the same view menu select gamut warning. Three shows the areas in the image that are not reproducible in print are highlighted in green, which establishes the problem colours which can't be printed. As mentioned above and in our soft proofing video, a conversion engine can be used to reduce the intensity of the out of gamut colours to bring them back into gamut, but we are going to use a different more manual approach is taken which requires subjective evaluation and editing techniques to pull the problematic tones back within the capabilities of the printer. One quick method is to add cyan to a specific colour to "dull" it down. So back to the example the oranges can be edited in selective colour by going to reds and adding cyan to the red. Notice how the cyan dulls the orange down reducing the amount of green flagged by the gamut warning. A second more complex technique involves the close inspection of the channel information in the image. In the layers palette go to the channels and subjectively evaluate the channel holding the most information. In our example the green channel holds a lot of detail. We can utilise this channel information to bring the orange back into gamut and increase the apparent detail in the image. Once on the background layer go to image menu and select apply image. In the source box select the image name. 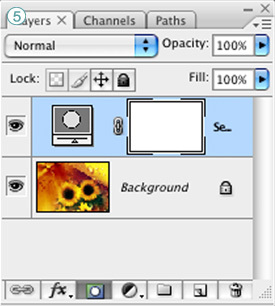 In the layer box select background layer and in the channel box select the channel with the most information e.g the green channel. 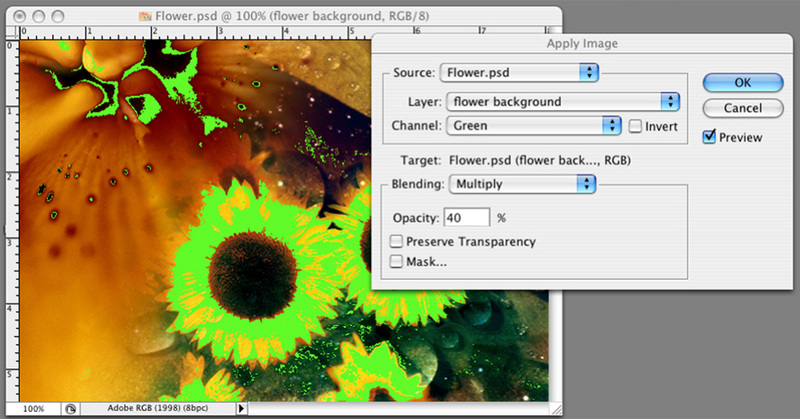 Now in the blending mode sl multiply and alter the opacity percentage to obtain the desired colour reproduction. Note further adjustments can be made to selected areas so the original integrity of the image is not comprised. For example localized corrections could be made where the green highlighted gamut warning still shows which in this image relates to the yellow petal areas. To correct this you can add an adjustment layer which is done in the bottom of the layer palette by pressing this icon. 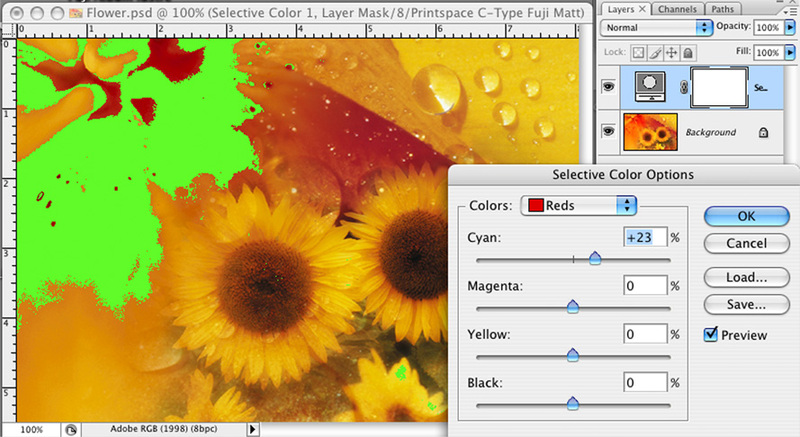 Choose selective colour from the menu that pops up and select yellow from the colour drop down. Using the magenta slider increase the magenta levels until you notice the green areas reduce in size and disappear. However we do not require this adjustment to apply globally, so to be more specific to the yellow areas in the image we will need to use a mask. To add a mask use the layer mask button in the layers palette. As the mask is currently white four the correction has been applied across the entire image. In order to hide the correction the mask must be filled with solid black. To do this go to the tools palette five make sure the background colour is black by click on the icon above the white and black squares. Notice how the mask is now black six and is therefore hiding the selective colour correction we just added. Repeat this technique until all the colours in your image have been pulled back inside the capabilities of the printer. Still unsure on how to set up your artwork ready for printing? Get in touch today to find out some more information about our 1 - 1 file preparation technician service.